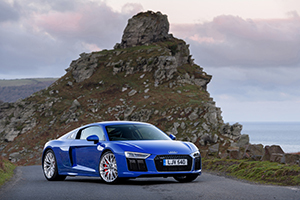 Front wheels, rear wheels or four wheels – Audi Sport is acknowledging that performance car enthusiasts have personal preferences when it comes to the way their power is transmitted to the tarmac by bolstering the acclaimed R8 range with the limited edition R8 Rear Wheel Series. Even more uncompromising in its pursuit of driver reward, this latest version of the much loved V10 super sports car makes history as the first ever rear-driven series production Audi model, following the global success of the R8 LMS GT3 racing car. Priced from £112,450 OTR, the new R8 Rear Wheel Series (RWS) has been available to order in the UK as a Coupé or Spyder since September, and first deliveries of UK examples, which are all built almost exclusively by hand at the Böllinger Höfe Audi Sport facility, will commence in March. Despite the overtly rearward bias in the drivetrain, performance off the line and beyond remains reassuringly breathtaking, with the 0-62mph sprint being dispatched in just 3.7 seconds (Spyder: 3.8 seconds) and the pace remaining furious until v-max at 198mph (Spyder: 197mph). The mid-mounted V10 engine, which is now one of the last naturally aspirated powerplants in the segment, produces 540PS and peak torque of 540 Nm (398.3 lb-ft) at 6,500 rpm. Its enthralling, visceral sound can be further enhanced by the fitment of a sports exhaust. Combined fuel economy in the R8 Coupé V10 RWS amounts to 22.8mpg, corresponding to 283 grams of CO2 per kilometre. For the Spyder, these figures are 22.4mpg and 286 grams of CO2 per kilometre. The Coupé weighs 1,590 kilograms (without driver), 50 kilograms (110.2 lb) less than the R8 Coupé with all-wheel drive which needs additional components like the propshaft, multi-plate clutch and centre differential. The Spyder is 40 kilograms lighter than the R8 Spyder V10, weighing in at 1,680 kilograms (without driver). The axle load distribution of 40.6:59.4 (Coupé) and 40.4:59.6 (Spyder) together with chassis and handling tuning specially adapted for rear-wheel drive provide for particularly entertaining driving. The electromechanical power steering is completely free of torque steer and enables precise handling. The chassis setup and control systems allow controlled drifts if the driver chooses “dynamic” mode in the standard Audi drive select and sets the Stabilisation Control ESC to “Sport”. The ESC intervenes reliably at the limit to keep handling in check. The purebred character of the new R8 variant is underscored by the matt black grille of the Singleframe and the matt black air apertures at the front and rear of the car. The upper sideblade of the Coupé is finished in gloss black, with the lower blade in body colour. Similar to the R8 LMS GT 4, a red Audi Sport decal running over the bonnet, roof and over the rear spoiler can be optionally applied to the Coupé. Inside, the driver and passenger sit in heated sport seats covered in leather and Alcantara. Bucket seats upholstered in rotor grey or black perforated Fine Nappa leather are also available as an option. As another visual identifier, the dashboard bears an emblem “1 of 999” indicating the limited number of units. The Audi R8 V10 RWS is fitted as standard with black-finished, 19-inch, cast aluminium wheels in a five-spoke V-design that are exclusive to the model, with 245/35 tyres up front and 295/35 at the rear. As an alternative, optional 20-inch forged aluminium alloy wheels in either matt titanium or gloss anthracite black are shod with 245/30 front tyres and 305/30 rears. Its specification mirrors that of the R8 V10 quattro, featuring all-LED headlights and LED rear lights with dynamic indicators as well as the Audi Virtual Cockpit, the high-definition Audi Sound System, MMI Navigation Plus with MMI Touch and a suite of Audi connect Infotainment services. The Advanced Key, Cruise control and the front and rear parking system plus complete the standard equipment package. Further enhancements can be made to the infotainment and assistance systems on board by specifying options such as Audi Laser Light extending the headlight range, a specially developed Bang & Olufsen sound system, the Audi Phone Box and Smartphone Interface. Audi Sport also offers owners the opportunity for full personalisation, with a gloss carbon finish extending to the mirror housings, front spoiler lip and engine bay, while the Audi exclusive programme can also be comprehensively applied to various touchpoints on the interior to ensure that no two R8s are the same. For the R8 Spyder RWS, a fully automated hood that retracts in 20 seconds at speeds of up to 31mph can be finished in black, red or brown, contrasting with the seven paint finishes, or even one of the 50 hues in the Audi exclusive palette. Hi Thanks for that, often wondered why the screen has no info on the number of satellites it has picked up. The engine light has now come on !